OK "1-2 pylon power" because this includes control box for UB-32 which is connected to 1-2 pylon power. Is procedure to turn 1-2 pylon power on for check without mentioning if UB-16 or UB-32 is carried because this power is always needed even without UB-32 or simply to make a single procedure for all cases? I forgot write about one thing more: PUS devices from external pylons are connected parallel with internals ones, so maybe that's why during check switching on circuits of pylons 1-2 is enough. I believe you about PUS-0 position regardless of pod situation but I wanted to exhaust possibility that engineer made some circuit which avoids this light for missions without rocket pod. For me this makes sense as a perfect design but I am convinced now that PUS-0 lights will simply shine for missions without rocket pods. For such missions when PUS power is on the zero position is just a constant signal. I know this looks bit weird those lights always on, but.....well, when you flight with bombs only or with fuel tanks only, RKT PSN lights can be off, because you don't need "MSL,RGM,RKT LCH" switch on. OK, fuel tank empty lights are on except when there are present and have fuel. What I find troubling is that if 3 tanks are carried and center or wing is dropped that single light does not come on. Only if all tanks are dropped does both lights come on together. If fuel is consumed normally lights come on at slightly different times. For me I wish MiG-21bis would consume first wing tanks then center tank instead of all three together but I guess 3 tank is only for transit mission without combat. I think, this depends from fuel consumption sequence. According manual: first 100 liters from tank 7, then all fuel from wing drop tanks, then 100 l from tank 7, then all from under fuselage drop tank, then 100 l again from tank 7 and so on. Yet of course bombs will not release from DCS airplane if LCH switch is off. It is not feeding first from wing and then center but almost together. Difference between wing tanks empty and fuselage tank empty should be consumption of 100+480L. As seen above it is 175. When wings and fuselage tank carried to wing empty signal 490L should remain in fuselage tank and about 2650 internal. This suggests that at wing or fuselage or wing & fuselage exhaustion there should be 50-250L missing from internal fuel. Because DCS module is using 0L internal fuel until zero fuel remains in any external tank then this amount is missing from the fuselage tank instead. If from triple tanks the center is immediately jettisoned ~820L is used before wing tank light comes on. ~200L more is used until fuselage light comes on (which was jettisoned long ago). Perhaps it is impossible for light to come on until internal fuel has decreased enough until that external wing (-100L) or external fuselage (-200L) is used. Filling from external wing tanks is keeping level in #2,#7 internal tank full enough that fuselage empty pressure is not tested? Normal drop order is then tested, immediately wing tanks are removed and check until lights come on. Wing light on solid at 4075L so 350L is used (too much) before absence of wing test pressure circuit is tested. This is almost exactly 2920 (initial fuel) -2600 (average 2700,2500). Fuselage tank is coming on 3975 or 100L later. If center tank only is carried and dropped immediately then light comes on immediately before internal fuel has reduced for pressure test. Theory is that if tank empty is only tested when internal fuel has dropped suitably then this light should delay signaling until internal fuel drops slightly (100L or so). Normal tank order not being followed strictly. Lights are coming on based on mixture of ideas from manual and simple consumption order. Idea of reduced internal fuel before wing stage and centerline stage external transfer is absent. Separation of wing stage and centerline stage external transfer is poor, for much of the time both are being taken from at once. the air is discharged into the tank 7 through the drain valve 4, which is open, since the command pressure supplied to it is discharged through the open valve in the float valve 4. The air pressure in the wing tanks during this period is equal to the pressure in the tank 7.
tanks enters the tank 2. If less fuel is supplied to the engine than is supplied from the wing tanks to the tank 2, the fuel level in the tank 7 increases, the float - new valve I opens the drain again through the valve 3A, a special valve 36 closes and the fuel production from the wing hanging tanks stops until the next fuel level in the tank 7 decreases. At the end of the production of fuel from the wing outboard tanks, the pressure in the pipeline of pressurization of these tanks drops (air passes through tank 2 to tank 7), the pressure indicator connected to the pipelines is triggered, and a green lamp lights up in the cockpit (DEVELOPMENT KR. BAKOBV). From tank 7, another 100 L of fuel is produced. The fuel drain through valve 2b of the float valve 1 is blocked, as a result of which the pressure in the cavity under the diaphragm of special valve 64 will increase, the valve opens and the fuel from the fuselage outboard tank starts to flow into tank 2. After the fuel is produced from the fuselage outboard tank and a pressure alarm connected to the pipeline, gives a signal for the green lamp to light up (EXT. TANK) in the cabin. (I) turn on the switch on the starboard side "ACCUM. BOARD. AEROD.". 2) Turn on the right side of the gas station "ADM HYDR. The ALARM. TANKS" will light warning light "CONSUMPTION. TANK" and the lamp "is produced. PODV. TANK", "DEVELOPMENT OF CU. 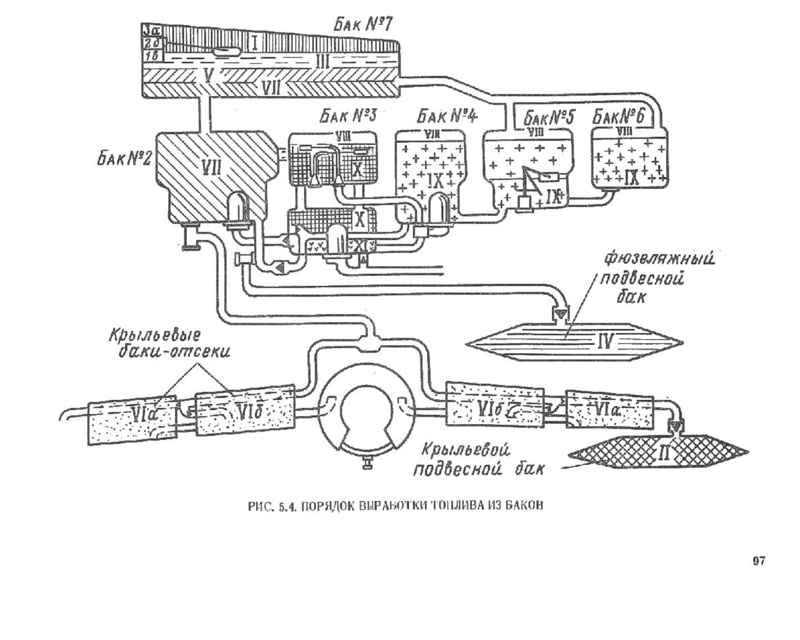 TANKS" (see figure 1.13). 3) If the overhead bins are installed to enable gas stations "RELIEF TANKS" at the right side under the glass, with the middle panel of the dashboard should light up the lamp "tank SUSPENSION", for the wing tanks-over-pisi "SUSPENDED 3 EXTERNAL, "" SUSPENDED 4 EXTERNAL,". 4) Turn on the right side of the gas station "RASHOMON. HACOC", with the signal inscription " FLOW. TANK" on the display of the instrument cluster should go out. the signal sign on the dashboard display should light up and go out . current signal inscription on the scoreboard, the dashboard needs to tan Xia and off. At the end of the test, turn off all the gas stations and the battery. After starting the engine with suspended and filled with drop tanks (which creates pressure) warning light "is produced. PODV. TANK" after a while, necessary to fill the tank with air, should go out. The lamp goes out at the speed of n, = 45+60%. When the engine is running without external fuel tanks lamp "is produced by, the MOB. TANK" and "DEVELOPMENT of CU. TANKS" should be lit. Most tank lights are pressure sensing. This is why 1st and 3rd tank group lights should normally be off when starting since signal is related to combination of system being powered on and pressure not yet enough. Proper result is that on switching on signal lamp comes on because power is applied but pressure is low. As pump runs for a time the pressure comes up and the signal goes out. For external tanks the same to show that external tank pressure shows empty until engine is up to speed to provide bleed air. Great Frederf, I wish that developers had yours attitude to details. Maybe you should put this on the bug tracker?. Only one thing: you overestimated difference between theoretical and usable amount of fuel. For fuselage tanks theoretical capacity is 2885 liters, usable 2805 liters, for PTB-490 usable 482 liters and for PTB-800 usable 795 liters. So from maximum fuel capacity (internal+2x490+1x800) fuel system lose 101 liters. Aha! I have an idea. 0-6000 for animation gives 0-1 output. All I must do is set 0.480833 for animation output (min and max) then 0.48655 for animation output. Then I can compare by three screenshot. This will be pixel perfect. OK screenshot of forced 2920 and 2885 output is reading more than default gauge. I will try 0.4675 which is 2805/6000 and compare to original. Original is half way between forced 2805 and 2885... 2850? You know I bet it is (2750+80)/6000. Yeah it's really really close to 2830/6000. OK default gauge shows ~2830 (not 2920) it just looks like >2900 because of parallax or something. This means fuel density ~0.795. You know I can fudge that offset of 80L just make input 0080-6080 equal to 0 to 1 output >.>. I'm sure that's not a proper adjustment but I'll see how it works out. Not bad. It will be nice not to always have to scrub off 100L every spawn. I think manual and signal would be gauge setting so usable amount of more so DCS lights are coming on too late. At 450L usable remaining there should be 530L in the system. Exception that dispenser tank should come on at near zero usable so that's fine. 2750 amount is used for manual procedure for some reason, 135L not 80L less than total. Is fuel rate sensor mass rate or volume rate so guard against low density? Extra flight safety? Sensor margin of error? Different tank for this nation's equipment to fit? Thermal expansion? Leave 50L not filled? Who knows. Interesting Grp I. warning light depends on engine on or off but Grp III not. I think by pumps or bleed pressure both should work the same. I or III light only goes on when I or III switch is on and pressure is insufficient. In contrast dispenser tank signal is on regardless of its switch if pressure is insufficient. Interesting stuff. 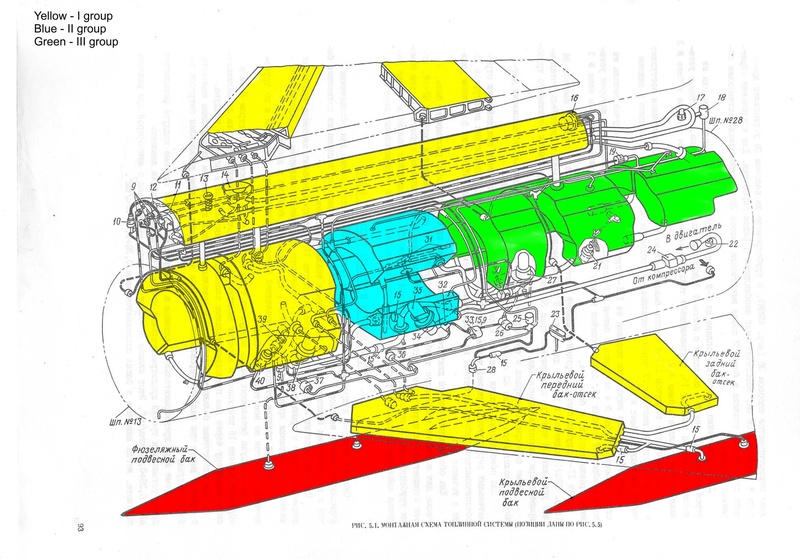 While searching around for more info, I ran across this page: http://www.topedge.com/panels/aircra...kraft/fuel.htm, which describes the fuel system of a Mig-21US. A few minor differences from what foxbat posted, like tank order and lack of wing drop tanks. I wish the system diagram was easier to read. I want to know which fuel tanks are in what group. Is my image correct? And where is tank no.1? Tank no. 1 is missing in some MiG-21 (including 75B for some equipment) but normal tank numbering is preserved. By hand written note Group I (2,7, wings? ), Group II (3upper, 3lower), Group III (4,5,6). I and III supply to II where production to engine occurs. By manual there are 13 tanks in total. Negative g compartment ensures the engine fuel supply under the action of a negative overload in the non-afterburning regimes over the 15s and in the afterburning mode during 5s. Jettison or empty of center tank produces immediate signal "ventral"
Jettison or empty of wing tanks produce immediate signal "wings"